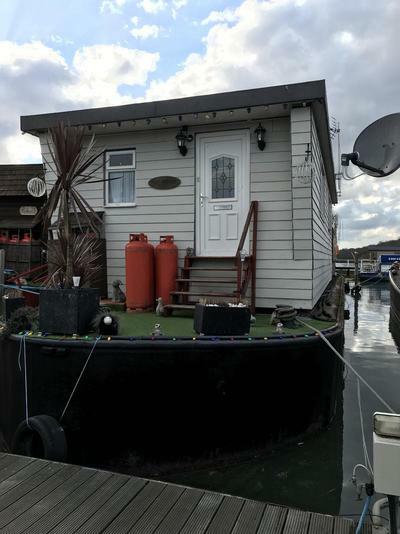 Premier Houseboats are pleased to present Mary Brent, a luxurious and contemporary houseboat, with spacious accommodation and excellent outside space. Mary Brent is extremely well presented throughout, with the layout providing comfortable living space and a good outside decked area, making her a perfect size for a family home. The upstairs accommodation is light and open, and comprises a fitted, modern kitchen and utility area, and a good sized dining area, with tiles floors and plenty of windows, all of which are double glazed. Patio doors lead to a well laid out deck area, with plenty of room to have friends round and fire up the BBQ on the long summer evenings. Stairs lead down to a large, open lounge area, the focal point of which is a new log burning stove. This comfortable lounge area is light and airy, and there is excellent headroom throughout the entire lower level. A door on the back wall leads to a good sized storage area. A hallway leads from the lounge to two good sized double bedrooms, and a family bathroom with bath, toilet and hand basin. At the end of the hallway is the master suite, a large bedroom with built in wardrobes, and an en-suite with shower, toilet and hand basin. Mary Brent benefits from gas fired central heating throughout, and is well insulated as well as well decorated. Externally she is in good condition and has been well maintained. Overall, Mary Brent is an exceptional family home, with little or nothing needed to be done to her, and offers excellent value for money and an idyllic lifestyle. Vessel name: Mary Brent Vessel condition: Good Year constructed: 1970 Berths: 6 Cabins: 3 Heads: 2 Length over all: 85' Beam: 18' Maximum draft: 3' Hull material: Steel Hull type: Flat Hull colour: Black Disclaimer Premier Houseboats offers the details of this advert in good faith as it was presented by the seller or his representative but cannot guarantee or warrant the accuracy of this information nor warrant the condition of the described item within this advert. A buyer should instruct his agents, or his surveyors, to investigate such details as the buyer desires validated. The Item described within this advert is offered subject to prior sale, price change, or withdrawal without notice.